← The Whistling Kettle-Down the memory lane. Kehwa, Kangri and Zafaran- three words which describe Kashmir so well. So it was for the taste of Kehwa and a tour of the saffron town, that we responded to Altaf’s call, whose family owns a saffron or Zafran field in Pampore in Kashmir,India. It is a 20 mins drive from Srinagar to cover 15 km distance to the town. 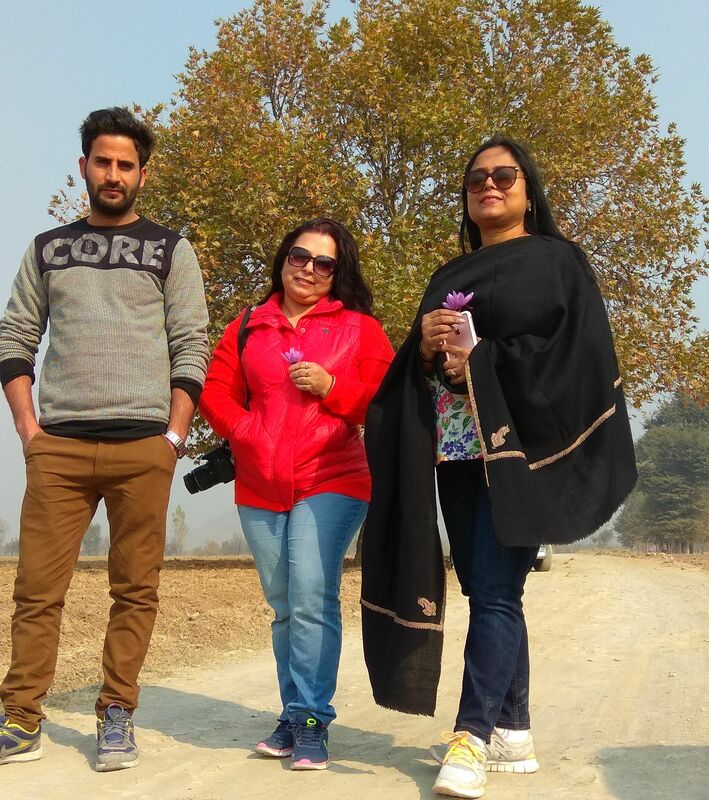 Every time I travel to valley, a consultant’s job (my excuse) takes me to many places , I am really touched by the hospitality and the affection that the people in mountains offer (yes,found the same in the entire stretch of the Himalayan belt). Despite all the trials and tribulation,it’s the people who remain the same with their personal connects. Altaf’s family are saffron traders too, with other businesses that they run alongside. My visit was on a dusty autumn day, the roads were being reconstructed with cars fighting with the smokey dust all around. 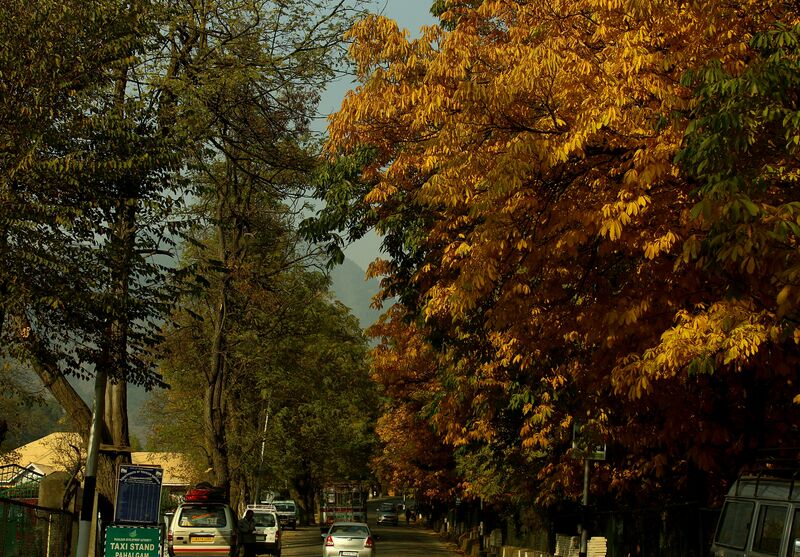 The weather carried the magic flavours of red and yellow chinar and populus trees. Saffron- or Zafaran has the hue of autumn in its leaves. The color and the flavour that emanates from it, is one of the best in the world. Iran produces 70% of the saffron but the ones which are produced in Kashmir are the best one as far as quality is concerned. Pampore, is famous in world over for its highest graded quality of saffron. Saffron is also grown, though in a limited scale, in Kishtwar of Jammu. Pampore and its neighboring areas produce an average of 2,128 kilograms of saffron every year. Almost all civilisations of the world find the mention of the herb in their ancient texts. Cleopatra is said to have bath with saffron water in ancient Roman empire. Saffron also finds a mention in The Kashmiri Tantric Hindu epics of that time which mentions about saffron cultivation and the herb being used as an aphrodisiac. 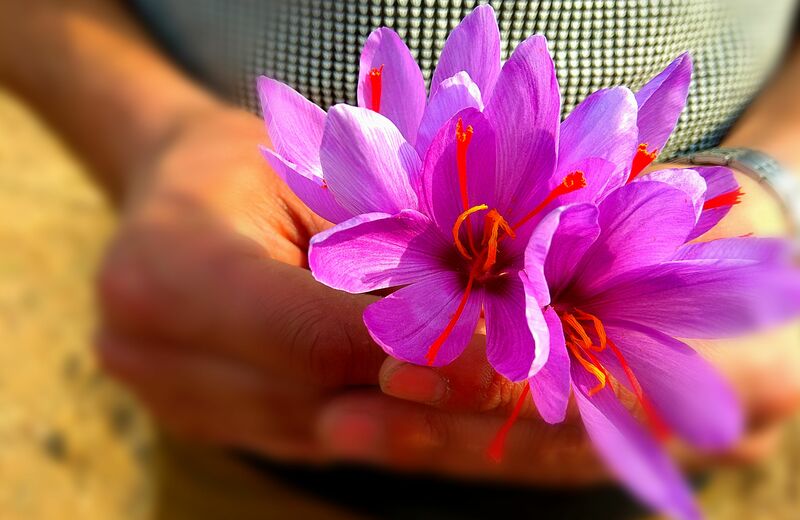 “In the beautiful valley of Kashmir, fields of crocus sativus- Saffron have heralded the dawn for close to 2500 years.” The herb has a high medicinal value and is a taste enhancer. Altaf explained to us how the weather conditions and the land plays a big role in the quality of the saffron. The ideal environment for cultivation of saffron is cool dry climate and rich soil with excellent drainage and organic content, and Kashmiri land is famous for all these rich qualities. There are three grades of saffron available in Indian market and they are known as Saffron Lachha, saffron Mongra and saffron Zarda. Saffron is not grown in any of the other fertile alluvial plateaus of Kashmir. Saffron as I said, is known for its medicinal , cosmetic and nutritional value. 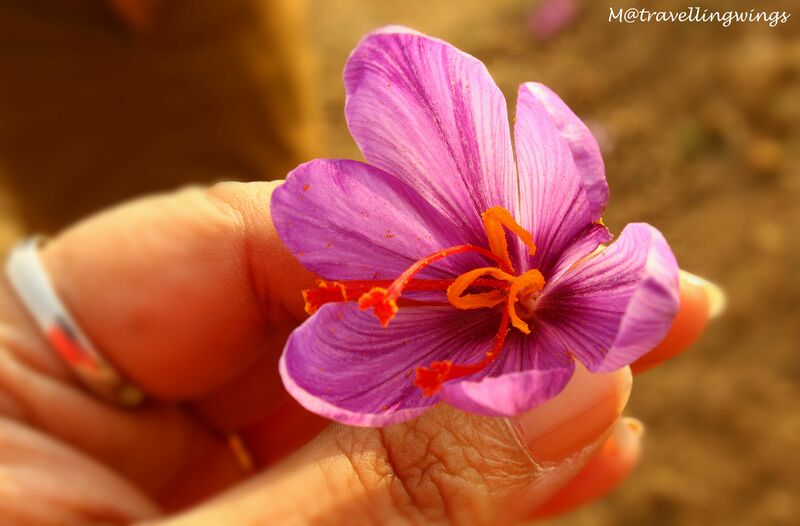 Saffron is used as an indigenous medicine across India. Saffron enjoys great reputation as a drug which strengthens the functioning of the stomach and promotes its action. It counteracts spasmodic disorders and sustains involuntary muscle contraction. This prized species is also used against fevers, melancholia and enlargement of the liver and spleen. A combination of Saffron and ghee is used to treat diabetes. Saffron also merits usage as a strengthening agent for the heart and as a cooling agent for the brain, also increases memory power. It has been found beneficial in the treatment of urinary problems. It acts as a diuretic if soaked overnight in water and administered with honey. The spice is useful in promoting and regulating menstrual periods. It soothes lumbar pains, which accompany menstruation. Saffron is also beneficial in the treatment of other ailments concerning women such as leucorrhoea and antidepressant effects. Ancient texts on ayurveda have information about the herb’s use as an aphrodisiac. Saffron is a promising herb of pharmaceutical industry due to its immense medicinal properties ranging from mild fever to cancer and DNA repair. Keeping in view its high market potential, traditional medicinal importance, promising herb of pharmacology and its wide habitat range, the cultivation of this prized herb should be appreciated by the Government, Agricultural Department and scientists of the related subject across the whole valley particularly in the areas where staple food crops are not cultivated. This year due to lack of rain, the fields did not yield much crop. The saffron growers are also waiting for a Govt. initiative to supply them with water sprinklers. The land has the capacity to yield just 3 times the present production. Result is that the prices were spiked to Rs.100000-Rs.125000/- per kilo. Our boxes were of 1 gm & 2 gms variety. The market price ranges from Rs.180- Rs.650/- per gram. Worth its value in gold. The Golden crop. ‘We are only worried about Rhizome Rot ( a vitamin deficiency which affects the crops heavily)” ,said Altaf. It is about 20 min drive from Srinagar – Boulevard Road. This same road leads to Pahalgam via Anantnag -the willow town. We also crossed the famous Badami Bagh Army Cantonment on the way. The houses are beautifully decorated with rich wooden frames and colourful paints on the exterior in sporadic localities on both side of the road. Somewhere in all the houses, I find a very strong European influence on the way they design them. This is a standard Kashmiri reply whenever we offer our gratitude for their hospitality. In Altaf’s house,the platters were just waiting for us. Kashmiri hospitality doesn’t have any language barriers. The feelings reflected in the wide smiles and a very positive body language amply express their hearty welcome. We were finding it tough to chose from a platter of czot, Kulcha,ghyev czot, chochwor, Khatai or sweet kulcha, shirmal breads that we were offered. What I observed in my numerous visits to the valley was that the mothers have a very pivotal role to play in the family. The family members all abide by the rules laid down by the women of the house. The society is quietly matriarchal and does not want the world to know. The platters were mouth-watering and the aesthetic presentation just reflected how creative they can be. The essential baked goodies at Altaf’s place. 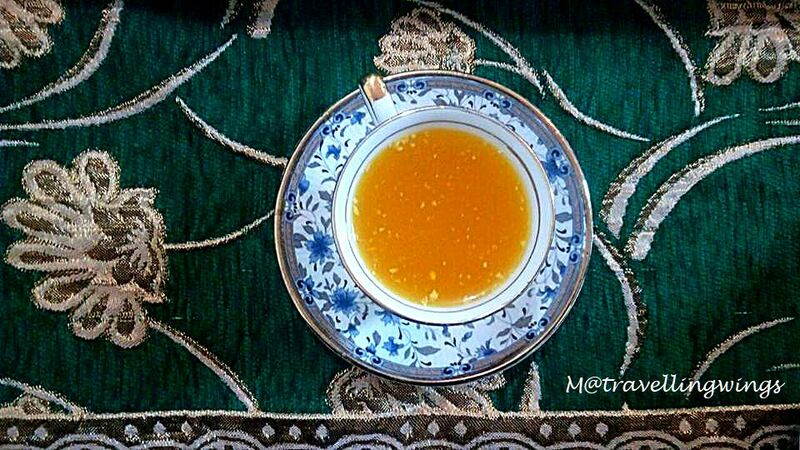 I forgot to mention it was accompanied with the finest Kehwa, I have ever tasted. 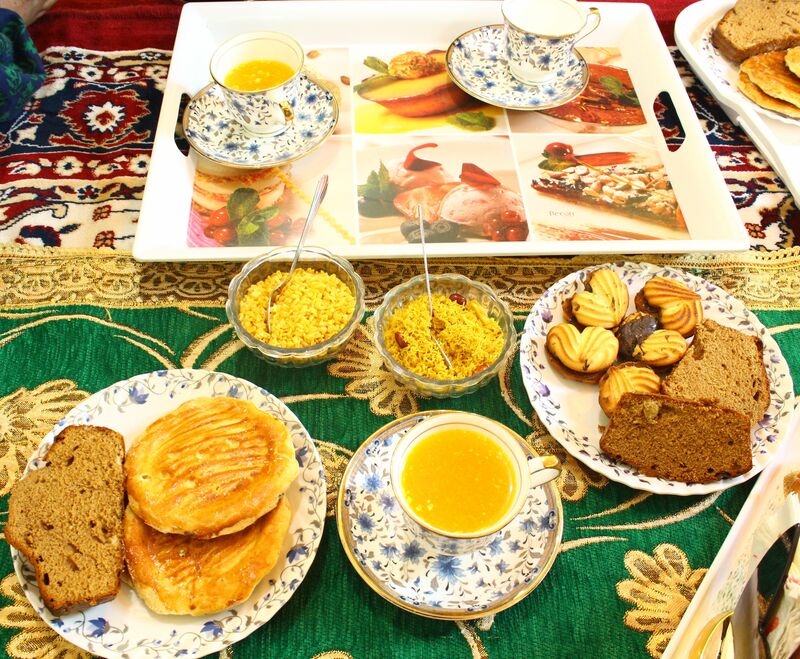 The talks with the family had to be translated , but the warmth and the repeated offers of the goodies, were very firmly balanced by us, as we had our breakfast just an hour ago. However, the ritual of the family members one by one peeping in to talk to us , really touched our hearts. The last but not the least were beautiful gifts for us presented in these boxes. The gift boxes carrying dry fruits and of course a bit of love. 4 cups of water boil with green cardamom (3-4 pods, cracked), cinnamon stick (1/2 inch piece), and 2 tablespoons sugar for 5-10 minutes or until fragrant. Take off heat and add 3 teaspoons . For saffron Kahwa, use 2-3 strands of saffron and cover for 2-3 mins or until color turns golden. Strain and serve with silvered almonds and sugar to taste (no milk). A bit of statutory warning though, Kahwa warms up the body hence scorching summers might not be a great time to drink it. Pic courtesy : Mohua & Rashid Bhai. 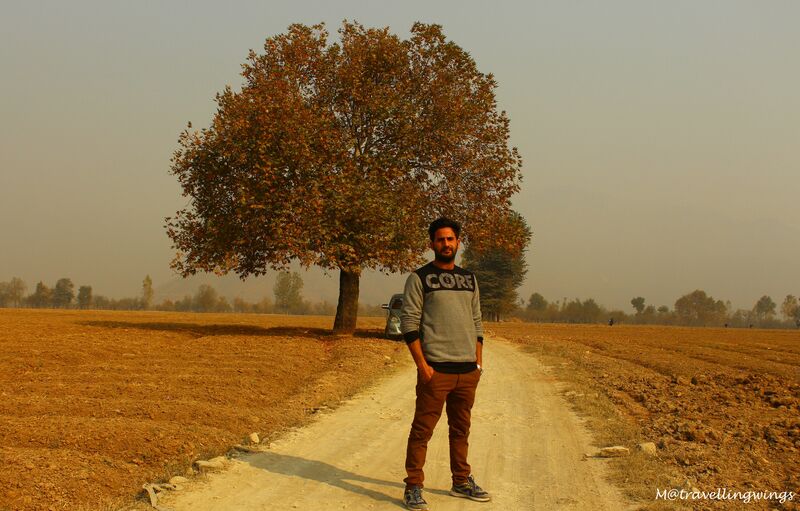 This entry was posted in Enchanting Kashmir, Nature, Travel Log, Uncategorized and tagged Baked goods, herbs, India, Jammu& Kashmir, Kahwa, Kashmir, Kehwa, Medicine, Pampore, Saffron, Srinagar, Zafaran. Bookmark the permalink. Awesome! Only such a delicate mix of weather and soil can produce a flavour as delicate as saffron! Thank you The Untourist. Yes,indeed. was quite overwhelmed myself.